Self discipline and adopting the mindset and motivation to make positive differences in one’s life isn’t as simple as flicking on a light switch. It requires time and practice to get onto that very road. Hard work doesn’t cost anything. All it takes is having the belief and willingness to do it. That can be a difficult process for many of us. Truthfully it can come much easier to some who only know hard work. But for those of us who struggle to stay focused, it requires a lot more from us mentally and perhaps even physically. As many entrepreneurs and successful people will tell you, if you’re motivated and determined to make it happen, chances are that it will. You just have to believe in yourself and be willing to continue trying and not fearing failure. Failure is part of life. It’s how you learn from failure and bounce back that helps you to be successful. 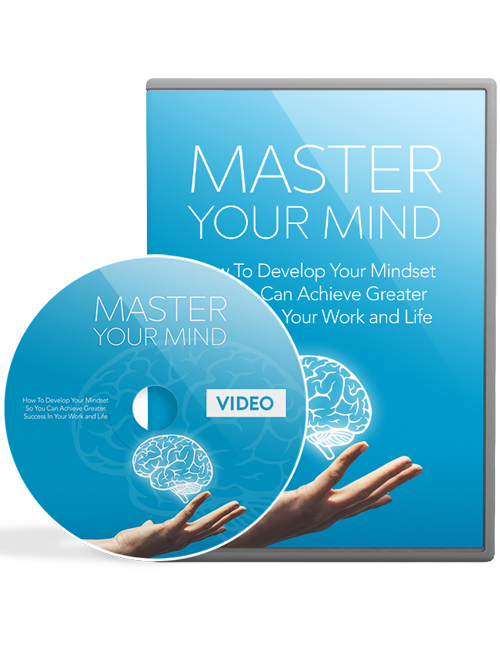 In this 10 part video course which also includes the Master Your Mind ebook, you will learn how to build the life you truly want. You’ll learn how to overcome the things that are holding you back and how to adopt the strength of mind to make things happen. You’ll also discover the many different strategies in training your brain, adopting new and better habits to improve your life, how to expand your mental awareness, finding the will to succeed despite life’s obstacles, understanding the power of The Law of Attraction, the key differences between emotional intelligence and mental strength and much more. Your path towards achieving bigger and better things starts with you. Grab this course now and see what it can do for you. Package includes a professional sales-letter and ready-to-go sales materials.